Hot N Chilli serves Paratha Rolls and sizzling BBQ at lunch and dinner. Home delivery service is also provided. 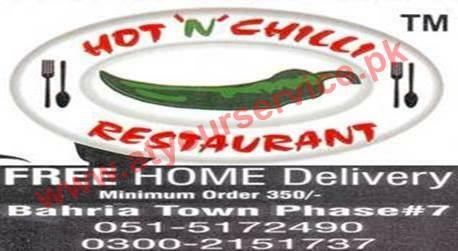 Hot N Chilli is located at Bahria Town Phase 7, Rawalpindi. It serves Paratha Rolls and sizzling BBQ. It is open for both lunch meal and dinner meal. Home delivery service is also provided.